SYRACUSE — Wawasee wrestling remained unbeaten as the Warriors went 5-0 at their November Duals at home in Syracuse Saturday, while Warsaw went 1-4 on the day at the super dual meet. Wawasee’s biggest victory came in come-from-behind fashion, 39-32, versus Mishawaka after the Warriors fell behind 15-0 early in the meet. The home team collected three pinfalls while sweeping the final four matches of the dual on the way to the win. Geremia Brooks’ first-round pinfall of Taylor Taft at 132 was followed by Braxton Alexander’s 7-3 decision over Gabe Weeks at 138, then Garrett Stuckman’s first-round pinfall of Salome Walker at 145, and Izzy Faurote closed it out with a second-period pinfall of Derrick Justin at 152 to clinch the Warriors the win. Wawasee collected convincing wins over Northern Lakes Conference foe Warsaw (67-8), Anderson (55-22) and Eastside (54-23) leading up to the dual with the Cavemen, and the Warriors capped off the day with a 63-15 win over West Noble to start their season at 10-0 following last weekend’s Warsaw Invitational championship. 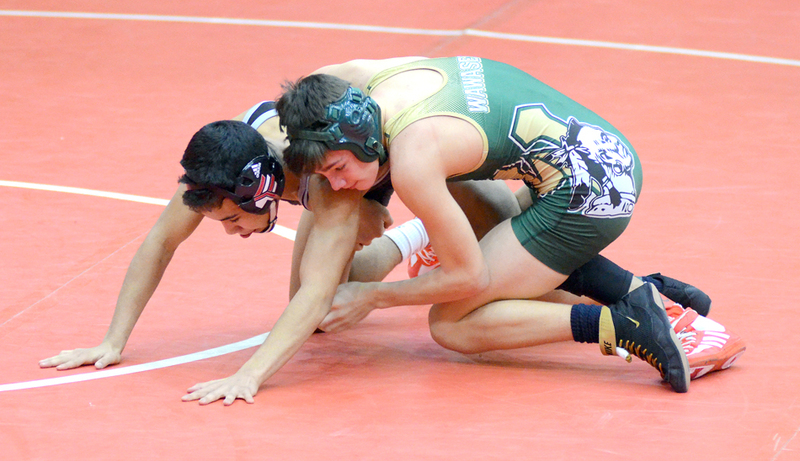 Brooks, Braxton and his younger brother Jace (120) all went unbeaten on the day, while Stuckman, Faurote, Alex Castro (182), Raymon Torres (195), Isaiah Tipping (220) and Dylan Tom (106) were all 4-1 for Wawasee. Warsaw’s lone win at the meet came opposite West Noble via a 45-27 decision, but the Tigers were competitive in a 42-35 loss to Eastside and a 44-33 defeat by Anderson. Individual standouts for the Tigers were Jose Grimmett (152), Brock Hueber (182), Jacob Bass (145), Brandon Estepp (160), Brock Hogenson (132), Andrew Ross (120), and Jose Martinez (113). Grimmett went 5-0 with a pin and two technical falls, and Hueber and Bass were both 3-2, with Bass’ three wins all coming by pinfall and Hueber collecting two pins and a forfeit. Mishawaka was 4-1 at the meet with wins over all but Wawasee for runner-up team honors, Eastside was 3-2, Anderson was 2-3, and West Noble finished 0-5. Warsaw hosts its first weeknight meet next Wednesday at home opposite NLC foe Elkhart Memorial at 6:45 p.m., and Wawasee will host Culver Military Academy Thursday at 6:30 p.m.